Today more than 170 people rallied outside of the Royal Bank of Canada’s (RBC’s) Annual General Shareholder meeting (AGM) in Toronto after a series of creative non-violent actions all morning. Inside, First Nations Chiefs and community representatives from four different Nations demanded RBC phase out of its Tar Sands financing and to recognize the right to Free, Prior and Informed Consent for Indigenous communities. Afterward, Indigenous leaders lead the crowd in a march to rally outside both RBC Headquarters buildings. Other cities across Canada supported the First Nations voices inside the AGM as well with solidarity actions from (click on a city for pictures) London, Calgary, Vancouver, Edmonton, Victoria and more. 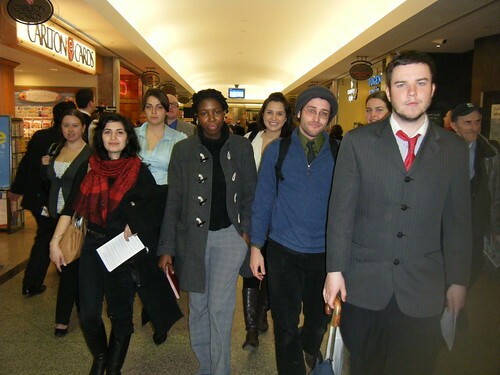 Check out photos from those and our events in Toronto. And beautiful photography from Allan Lissner. And see some preliminary media coverage from the Wall Street Journal and Yahoo. Since 2007 RBC has backed more than $16.7 billion (USD) in loans to companies operating in the tar sands—more than any other bank. Called, ‘the most destructive project on Earth,’ Alberta’s tar sands projects will eventually transform a Boreal forest the size of England into an industrial sacrifice zone complete with lakes full of toxic waste and man-made volcanoes spewing out clouds of global warming emissions. Inside the shareholder meeting, Chief Al Lameman of Beaver Lake First Nation, Alberta,Vice Chief Terry Teegee of the Carrier Sekani Tribal Council of BC, Hereditary Chief Warner Naziel of the Wet’suwe’ten First Nation of BC, and Gitz Crazyboy of Athabasca Chipewyan First Nation addressed RBC CEO Gordon Nixon directly about the way tar sands extraction projects have jeopardized their health and their rights. Downstream communities have experienced polluted water, water reductions in rivers and aquifers, declines in wildlife populations such as moose and muskrat, and significant declines in fish populations. 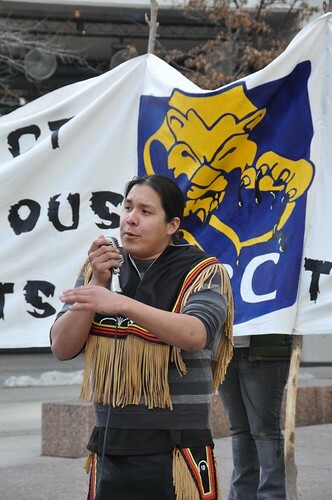 Tar sands has all but destroyed the traditional livelihood of First Nations in the northern Athabasca watershed. I originally posted this on itsgettinghotinhere. We’re still reeling from our success yesterday. During rush-hour commute this morning, two Indigenous Canadian women – Eriel Tchekwie Deranger, and Heather Milton-Lightening – scaled flagpoles in front of the main entrance of Royal Bank of Canada’s (RBC’s) headquarters in Toronto, dropping a banner reading “Please Help Us Mrs. Nixon.com” – appealing to the bank to pull its massive investments in Alberta tar sands projects. Supported by RAN, the Ruckus Society, and their Indigenous People’s Power Project, they were joined by dozens of Toronto RAN activists, swarming entrances to ensure every RBC employee heard our appeal Mrs. Janet Nixon, the wife of RBC CEO Gordon Nixon, to lend her strong and influential voice to those fighting to protect Canada’s clean water and respect Indigenous rights by pushing RBC to stop bankrolling the tar sands. 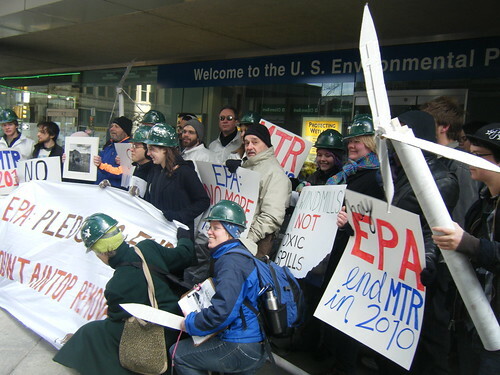 They handed out flyers, held banners, and even circled the building on bikes with “Please Help Us Mrs. Nixon.com” flags. 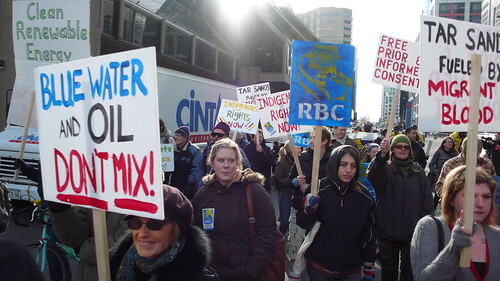 RBC is the ATM of the Tar Sands. 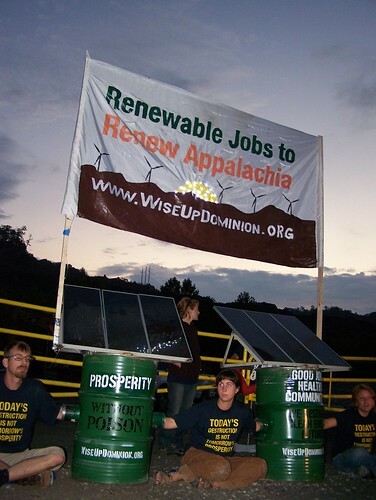 They are a leading investor in what has been called the dirtiest project on Earth and is one of the greatest social and ecological injustices of our time. Unless they’re stopped by grassroots pressure, oil companies will transform a boreal forest the size of Florida into an industrial sacrifice zone – complete with lakes full of toxic waste that are so big that you can see them from outer space. Tar sands projects poison First Nations Communities, pollute precious water resources, kill wildlife, and are the single biggest contributor to global warming from Canada. Check out ongoing news coverage that is just starting, from Bloomberg, CBC, Toronto Star, Toronto Sun, Canadian Press, Daily Kos, Financial Post, Canada.com, Brandon Sun, Stockhouse, KBS Radio, New Brunswick Business Journal, AM 1150, Canadian Business, Vancouver Sun, and much more. See lots of photos of the action here. 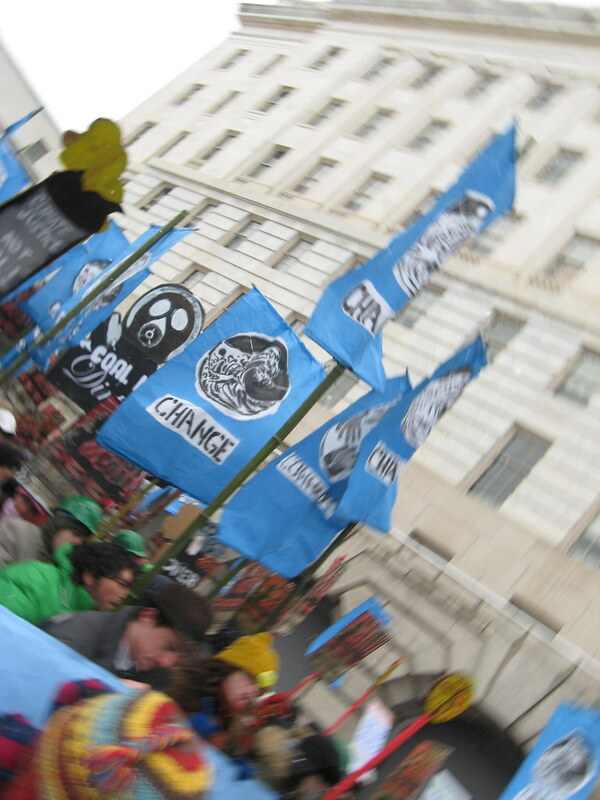 Today Rainforest Action Network activists kicked Fossil Fools Day off with a bang, dropping banners off of a highway, greeting over 4,000 cars stuck in deadlock traffic over a period of two hours. 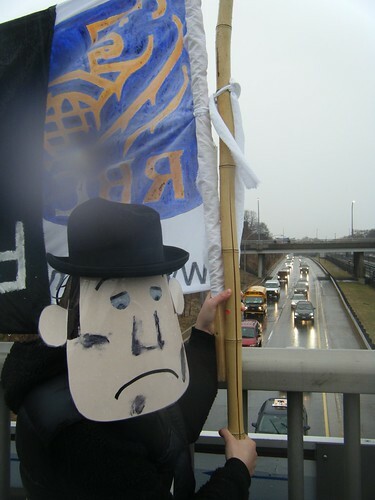 From bridges, we broadcast messages about Royal Bank of Canada (RBC)’s financing of the Canadian Tar Sands from our makeshift Pirate Radio station. 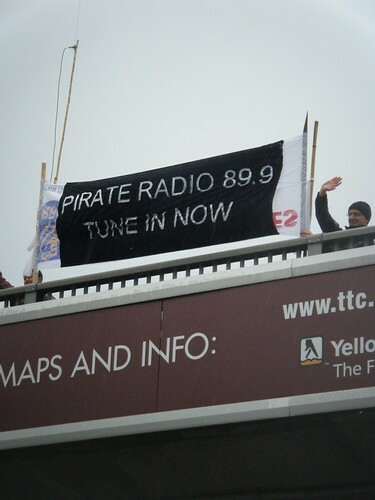 Our banners read “Pirate Radio 89.9 FM Tune in now” and “Royal Bank creates climate chaos. Renewables not tar sands.” The pouring rain didn’t block our view of car after car reaching for the radio dial as they drove under us. Listen to the audio broadcast we played here! 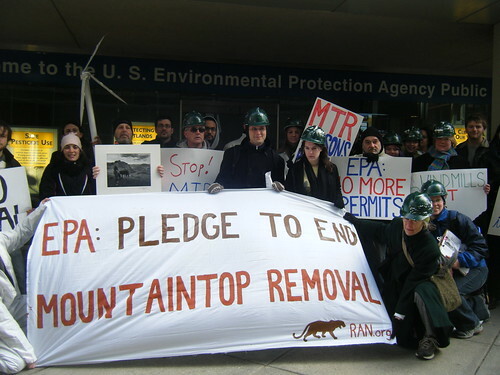 We moved on to RBC’s headquarters downtown, and throughout the day were joined by over 30 activists filtering in and out for the festivities.